In the late 1390s, the knight Diego Gonzalez de Carvajal was certainly a young man and likely just to pass his teenage years; his lineage and family connections suggested he had a promising and prosperous life ahead of him. He was the son of a well-established caballero in Plasencia and the son-in-law of Comendador (Knight Commander) Diego Garcia de Ulloa, a leader of knights in Aldeanueva. At the time of his death in the late 1450s, his testament gives one the impression that he did not suffer for lack of monetary and property wealth as he bequeathed over 62,000 maravedis (a silver coin) in money to heirs; owned an extensive housing complex, with its own “palacio”, on the main plaza in the city of Plasencia; and held a varied portfolio of properties in the region, including twenty-three stables, several vineyards, an income-generating grain mill, and over two-dozen other houses and lands (To appreciate the value of 62,000 maravedis, consider that the average salary of a church canon was just 185maravedis a year.) His testament makes clear that Diego Gonzalez de Carvajal was very concerned about the distribution of his wealth to no less than twelve children by his three wives. To all let it be known that with this letter of testament, taken from me, Diego Gonzalez de Carvajal, resident of the city of Plasencia, and being of good memory and understanding…for my soul…and fervently believing in the sanctity of the true Father, Son, and Holy Spirit and the Holy Catholic faith, and I understanding that death is a natural thing that no creature or no person has the power to escape from, I establish and order this my testament and of my free will and in the manner that is presented. First,…that my body be interred in the Iglesia de San Nicolas, in the said city, next to the Altar of Holy Mary in the Sepulcher where the body of my mother, Sevilla Lopez, is buried. On the day that I am buried that you say for me the Vigil and that you also say for me in the said church, ten masses as is customary, and on the day of my burial that ten of the poor be well fed with bread, wine, meat, and fish and the following day the of my burial that bread and wine be provided to their table for a year. 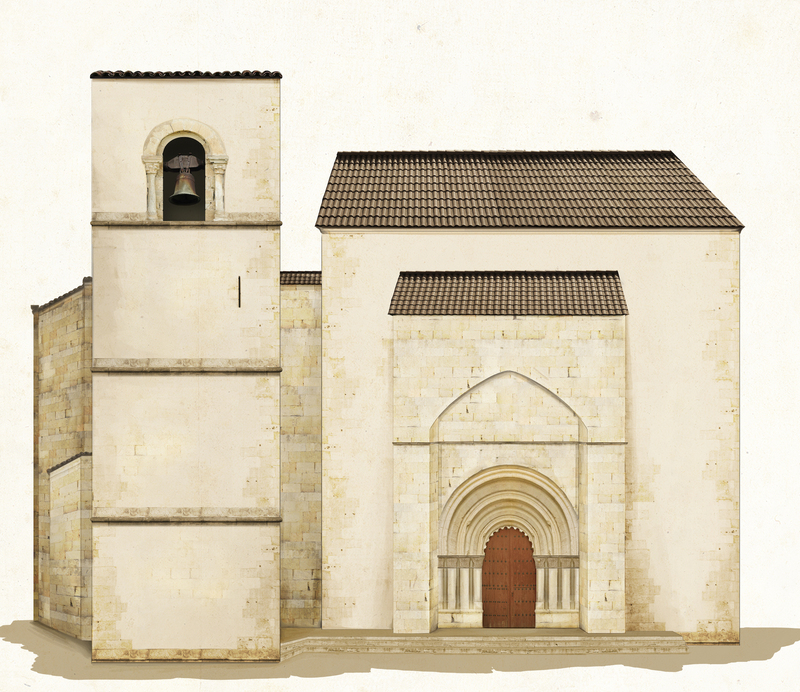 Drawing 1: Virtual Plasencia’s reproduction of the Church of St. Nicholas (Iglesia de San Nicolás). Original artistry prepared by David Seidman. And I will to the Trinidad y Cruzada y Sancta Olalla de Barcelona, to each religious order, …and for the works of the cathedral, twenty maravedis to each. And to the other churches and hermitages in the said city and their suburbs within one league…one maravedi for lamp oil. I ask that the church of San Nicolas and its clergy say a Trinitarian for me and in the Monastery of San Francisco that that say a Trinitarian for the souls of my lady, Juana Gonzalez, wife of the Bachiller Fernando Alonso, and [mother of] Catalina Gonzalez, my first wife, that for the customary masses that are said I give that which is the same salary paid to the clergy of the Iglesia de Santiago del Arrabal of the said city, where I am a resident, the amount of 200 maravedis. For doing so in the manner that I have asked I give two stables, a residence in Serradilla…, and an additional 300 maravedis pension from my third of an inherited property from Julian Perez, which is a rented property of mine, and the earnings from one-quarter of a half ownership of a flock of sheep of the rents produced forever. I will that on that the day that I die that Rodrigo, my son, take possession and tenancy and lordship of the said inherited properties as I will and yield and direct, and that no Pope, nor Cardinal, nor Archbishop, nor Bishop, nor Provisor, nor Visiting Prelate, nor Judge, nor any Vicar, nor other ecclesiastical or secular Justice, nor any of my heirs can demand me or demand Rodrigo, my son, make claim against any of these inherited properties nor any of their fruits or their rents…and if he should die and he have legitimate heirs, then his eldest son shall take ownership of the said property. With the inclusion of these specific inhibiting clauses Carvajal highlighted the multi-layered and overlapping nature of legal authority in the mid-15th century. Diego Gonzalez fortified his testament with these clauses preventing local, visiting, and distant ecclesiastical and secular officials from asserting their prerogative to change Diego’s will. The only earth-bound agent prevented from acting, as he was the ultimate lord for the Kingdom of Castile, was the king. And because the said Teresa Rodriguez, my wife, brought and gave to me a small amount of silver that I had made into a rounded embellishment and guard  with the figure of a pine tree for my sword, I will that it be for the said Teresa…because it was made with her silver. …and at the time Teresa Rodriguez married me, she brought and gave to me some bed clothing and jewelry and household items, that I can value in fair estimation five thousand maravedis…that I will that she be given goods of mine that are worth five thousand maravedis, which should make her content. And I ask that Teresa Rodriguez…who is in the same houses that I am living, that she be allowed to live there until a year and a half after my death…and that no person can remove her from the house during this time…and she is to be given nine bolts of the finest black Flemish wool that can be had and this is the most important to understand of all the things that I have willed. And during this marriage of myself and Teresa…we purchased a house that we called El Palacio in Seradilla, with a little bit of land that was adjacent to the house and it had half a quarter of a stable connected to the houses of Juan de Alfonso de Arevalo, of which my half of this property I give to her so that she owns it free and clear forever and to pass on to her heirs. Thankfully for Teresa Rodriguez de Yanguas’s gift a rare glimpse at the detail, the pine tree embellishment and guard (taza), on Diego’s sword is revealed. Diego closes his original will by naming his third wife, Teresa Rodriguez, and his eldest son, Rodrigo Gonzalez de Carvajal, executors of his will. As executors they were charged with disposing of enough of his land holdings and other assets so that all heirs can be paid, and the remaining assets would remain the property of Rodrigo. Archivo de la Catedral de Plasencia (ACP) Legajo 14, Doc. 25. ACP Legajo 14, Doc. 25, Folio 3. ACP Legajo 14, Doc. 25, Folio 3-3v. ACP Legajo 14, Doc. 25, Folio 3v. ACP Legajo 14, Doc. 14, Folio 2. Cordero Alvardo, Pedro. 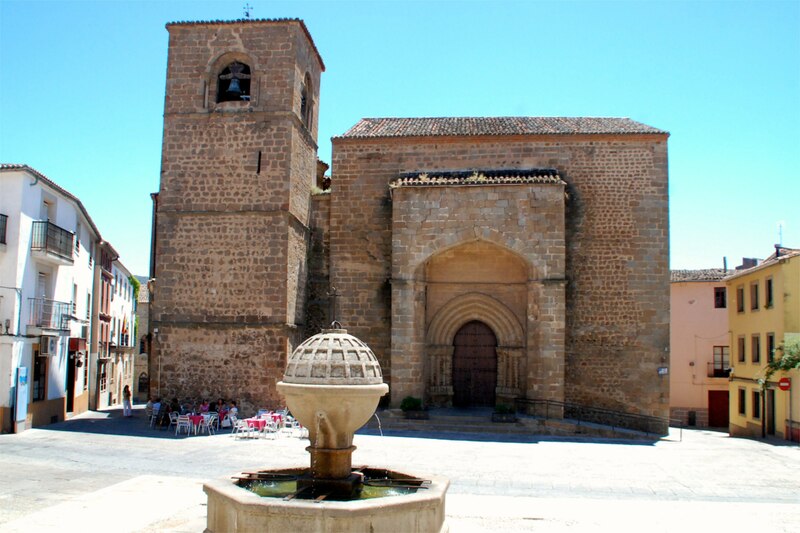 Plasencia: Heráldica, Histórica y Monumental. Plasencia: Graficas Sandoval, 1997. pp. 99, 103. Don Pedro Carvajal y Giron was the direct descendant of Diego Gonzalez de Carvajal, also known as Diego Gonzalez, the fourth. Don Pedro’s father was Diego Gonzalez de Carvajal, the fifth. Treintanario cerrado: Número de 30 días, continuados o interrumpidos, dedicados a un mismo objeto, ordinariamente religioso. Forro: Canon o pensión que se paga en virtud de este contrato. ACP Legajo 14, Doc. 25, Folio 3v-4. ACP Legajo 99, Doc. sin numero. Regarding Don Gaspar Suarez de Carvajal, Prueba, 1628. ACP Legao 14, Doc. 38, Folio 2v. ACP Legao 14, Doc. 38, Folio 2. ACP Legajo 14, Doc. 25, Folio 4. The scribe’s marginalia alongside this sentence indicates that Maria was a “hija bastarda,” or an illegitimate daughter. ACP Legajo 14, Doc. 25, Folio 4v. One last possible clue about the identity of Juana Gonzalez la Sevilliana or Juana Gonzalez de Ulloa is nestled, of all places, in Catalina Gonzalez last testament of 1431. Twenty-four years before Diego prepared his testament, his wife Catalina Gonzalez provided a gift of three hundred maravedis to her loyal handmaiden and servant, Juana de Sevilla. However, it seems highly unlikely that Catalina would take one of Diego’s mistresses as her servant, much less leave her an inheritance. See ACP Legajo, Doc. 38, Folio 2. ACP Legajo 14, Doc. 25, Folio 4v-5. ACP Legajo 14, Doc. 25, Folio 5. ACP Extractos del Inventario de los papeles del archivo, Tomo 1, Folio 11v-12. 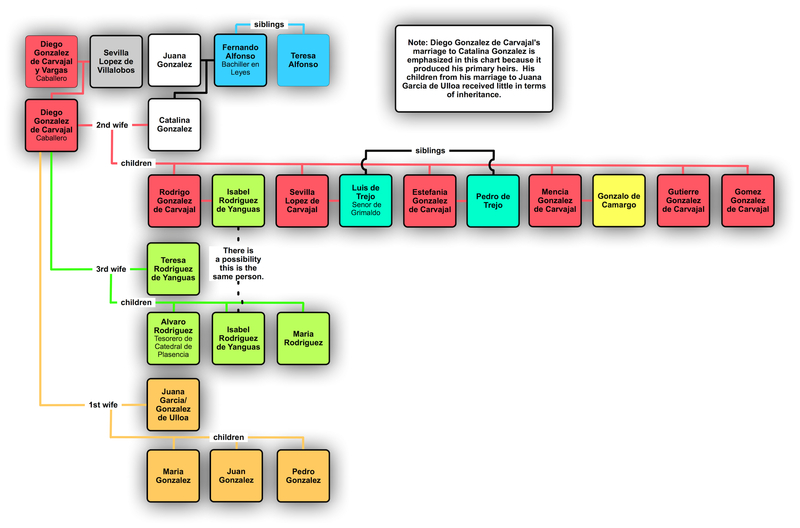 Estefania’s husband, Pedro de Trejo, is named in Diego’s testament as well as in a manuscript detailing a conflict between the Carvajal-Trejo family and Alvaro de Zuniga, the Duke of Plasencia. See ACP Legajo 1, Doc. 44, Folio 1. ACP Legajo 14, Doc. 25, Folio 6-7. ACP Legajo 133, N. 17. ACP Legajo 14, Doc. 25, Folio 6v. ACP Legajo 14, Doc. 25, Folio 9. ACP Legajo 14, Doc. 25, Folio 8. Taza: Pieza de metal, redonda y cóncava, que forma parte de la guarnición de algunas espadas. ACP Legajo 14, Doc. 25, Folio 8-8v. In ACP Legajo 5, Doc. 37, during the 1460s, Alvaro Rodriguez is reported as the Treasurer in the Cathedral of Plasencia. See ACP Legajo 14, Doc. 42 for Isabel’s full name, Isabel Rodriguez de Yanguas. ACP Legajo 14, Doc. 25, Folio 9-9v. ACP Legajo 14, Doc. 38, Folio 2. ACP Legajo 14, Doc. 25, Folio 9v.